There is perhaps no better way to use up the seemingly endless amount of jars of fruit preserves littering my pantry than to stuff disks of lardy, buttery dough with them, baked until golden brown, and hungrily consumed when just cool enough to handle. Jam and chocolate chip filled empanada. The dough in this recipe calls for the use warm water and room temperature fats, rather than chilled as if frequently done in pastry, producing a slightly less flaky but sturdier pastry, better able to hold in the fruit filling. Though the recipe calls for a 50-50 mixture of lard and butter, it is possible to use either all lard or all butter, yet the combination of the two is perhaps better than either one is alone. Place the dry ingredients in a small bowl and mix to combine. Add the lard and butter, cutting into the dry mixture until a dry and crumbly mixture is achieved. Add most of the water, working it into the dough completely before adding more. Add the remaining water if necessary. Dough should be pliable and just slightly tacky, but not sticky. Knead the dough for one or two minutes, flatten into a disk and wrap tightly in plastic. Allow to rest, refrigerated, for 30 minutes. Portion the dough into 16 equal pieces, approximately 40 grams each. Smooth each portion into a ball, flatten slightly and roll out on a lightly floured surface into approximately a five-inch round. If, like me, you have some slight difficulty in making a perfect round with the pastry, there is no shame in using a sharp paring knife to trim an uneven edge into shape. No shame. 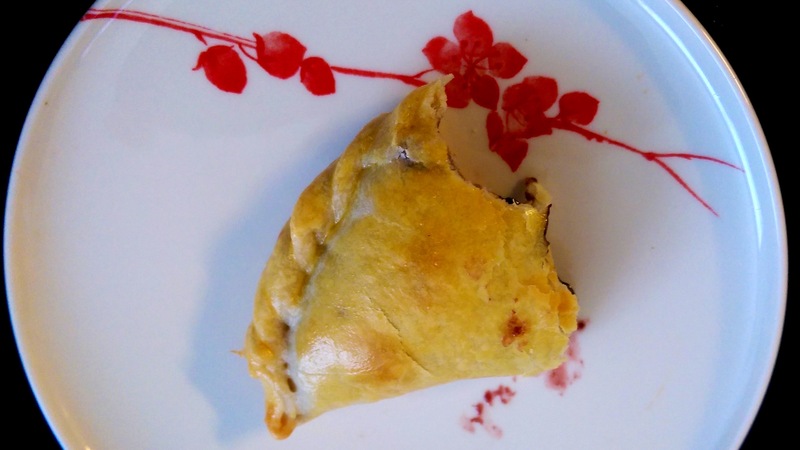 Place a heaping tablespoon of jam filling on one half of the empanada, leaving 1/2″ clear at the edge. Top with a sprinkling of semi-sweet chocolate chips. 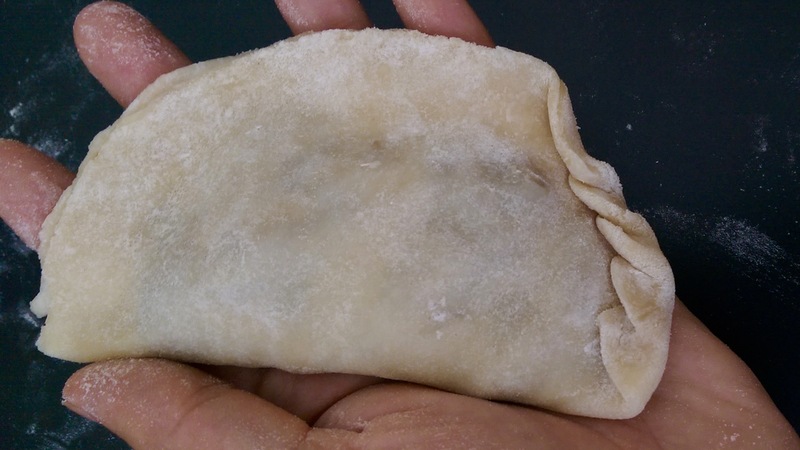 Very lightly dampen the filling side edge, fold the empanada in half and press lightly to seal, being sure to seal the edge completely to prevent the filling from leaking out. Fold the bottom corner up to create a repulge, or rope edge. To create the rope edge, called repulgue in Spanish, start by folding the bottom edge up, using the thumb to do so. 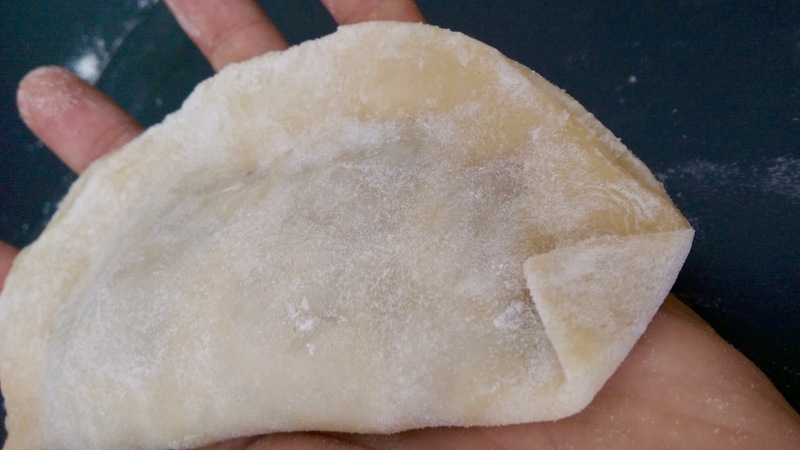 Continue to fold the edge, pushing the dough with the thumb over the index finger, pressing into the empanada slightly to maintain the fold, finishing by folding the top edge down. Place on a parchment lined or non-stick baking sheet. Continue to fold the dough with the thumb, pushing over the index finger. Mix together one egg yolk and a teaspoon of milk or cream. Brush tops and sides of empanadas well with egg wash.
Bake at 350ºF for 25 minutes, or until light golden brown.